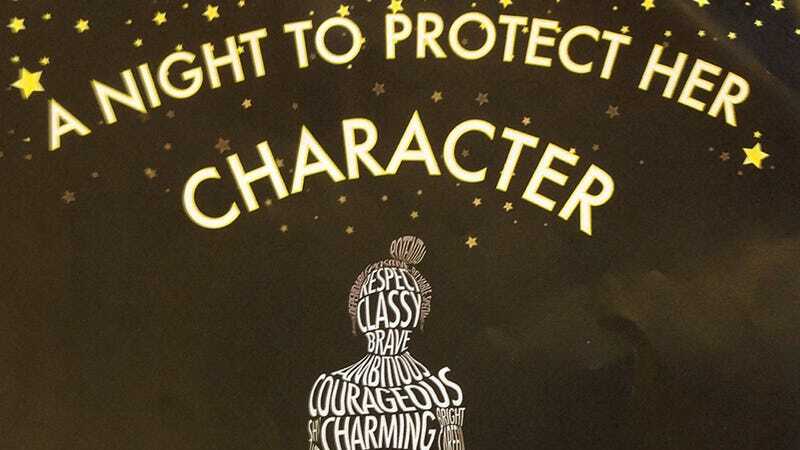 The school district and the organizations sponsoring the posters disagree that the message is at all sexist or shaming of women, not seeing the fact that the sign is all about protecting “the woman’s character” as a problem. Manitowoc Public School District said in a statement the posters were meant to “promote a positive prom experience” and did not promote a religious theme. “Social media reaction has demonstrated that any message can be interpreted in a wide variety of ways, many never contemplated or intended to be part of the original message,” the district said. It’s not clear how a poster featuring a woman whose character might be ruined by doing it on prom night might have been misinterpreted by social media (it’s a pretty basic message), but the school district isn’t apologizing and neither, unsurprisingly, is The Crossing Of Manitowoc County. When I called The Crossing to see if I could obtain a high-quality version of the poster, I was told that the only person taking calls about the poster now was the executive director, which suggests that mine was likely not the first. The woman who answered the phone, Belinda, seemed very flustered about the whole thing. Feministing reports that after being reminded that it’s a public school, Lincoln High took the posters down.